Alaska Airlines sought to add another level of service between Coach and First Class. Called "Premium Class," this new product represented the most significant new offering for Alaska in 25 years. 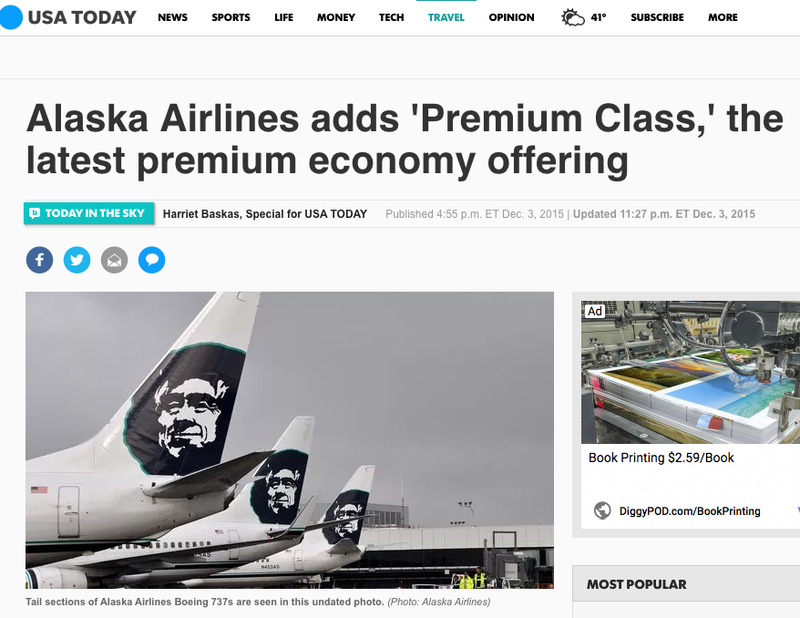 My role was to provide customers the ability to discover, consider, and purchase or upgrade to the new product using AlaskaAir.com or the mobile app. I ran this project, and I managed the UX and visual designers who worked on the project and produced the images below. I also led all stakeholder meetings. create a harmonious Premium Class experience, from the website to the airport to the airplane. Launching and selling a product as substantial as Premium Class is more complicated than a typical e-commerce initiative. First, airline purchases need to accommodate frequent flyers whose status may provide a complimentary upgrade, and defined deliverable milestones are needed to ensure crew are trained, certifications in place, and airplanes configured in time for product release. To address the need to accommodate frequent flyers, I had the design team start the project designing for two unique personas developed in a complementary project--an elite traveler (Barry) and an infrequent but indulgent traveler (Madison). We talked through the needs of each persona to center this design activity on the needs of particular travelers. On the project management side, I had the team start with the assumption that we'd deliver a near-term experience for the product's launch, but that there would be additional experiences we'd like to add after launch. To that end, I had the team focus on two threads: experiences for each persona, as well as experiences for the near-term and the long-term. The first step was to work through the discovery and purchase flows for both the key personas. Once we felt confident with the flows, we began adding details to the concepts to allow us to user test them and gather stakeholder feedback. Here’s a wireframe a designer created to facilitate testing. We conducted dozens of moderated and unmoderated usability testing sessions to ensure people understood the experience, how to pay/upgrade themselves to it, etc. These tests used participants who aligned to the personas we based the project on. I also hosted bi-weekly review sessions with team members and executive stakeholders to ensure the digital products aligned to the physical product offering (e.g., onboard experience, airport experience). The product was successfully launched in December of 2015, and featured the ability for customers to learn about and purchase it in checkout, upgrade to it after checkout, or opt into it as a frequent flyer upgrade. My team also created website experiences to market the product. User Interface for seat map purchase. When a customer selects a Premium Class seat, s/he can see the cost of that upgrade at the left (pricing for Premium Class is variable based on route/demand). My team also designed the online marketing of the product. The product successfully launched and is now available to purchase or upgrade into! "[Jerrod] is the kind of manager every designer seeks. He appreciates his designers and provides thoughtful, actionable feedback. His approach to critique and feedback was to continually encourage personal and professional growth, which created an environment of mutual respect. While proactively empowering each and every team member, he has worked hard to create a high performing team that works well together to tackle all manner of design problems. He effectively represents his team and design as a whole to leadership and other disciplines, which has in turn resulted in collaboration across aisles that previously would not have occurred."